Cauliflower is an underrated vegetable. It has very little flavor so you can use it as a low carb substitute for starchy foods. For example, try it as a substitute for potatoes in mashed potatoes, blend it up into a cream sauce, put it in a food processor to make cauliflower rice, or make it into a crust on pizza. 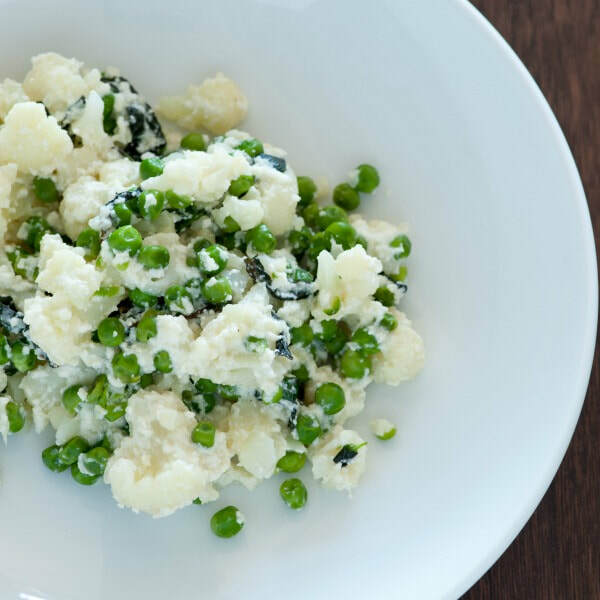 Combine cauliflower, peas and water in a microwave safe bowl. Cover and microwave on High for 6-8 minutes, or until fork-tender, stirring after 3-4 minutes. Let stand, covered. Place onion and butter in a separate microwave safe bowl and microwave on High 1 - 1 ½minutes, or until onion is tender. Stir in flour. Microwave a few seconds until flour mixture starts to bubble. Add remaining ingredients. Microwave on High 1½ to 2 minutes, or until thickened, stirring every minute. Drain vegetables. Pour sauce over vegetables and stir to coat.